Here’s an active speaking lesson plan on comparatives/superlatives for upper-beginner English learners: DOWNLOAD PDF. It doesn’t require technology. In my opinion, all lessons should include at least a few activities that don’t need a computer and/or projector in the classroom. I’ve done variations of each activity in this lesson plan, and they’re easily adaptable to fit most topics and age groups. The introduction/warmer portion of a lesson should be welcoming and engaging to get students excited about English. I often do a quick game to review what was done in the previous lesson, or facilitate Pass the Ball to practice English greetings with beginner-level students. Play some music, or sing a song as students pass a ball around the classroom. Allowing them to throw the ball is fun, but usually gets out of control. When the music or singing stops, the student with the ball must stand and ask or answer a question. Questions can be written on a whiteboard, shown on a screen, or asked to/answered by another student, the teacher, or the entire class. Repeat this for a few rounds until students are more motivated to learn. One way to introduce the vocabulary in this particular lesson is to get students involved. Demonstrate the new words by asking for volunteers to come to the front of the class. Once students are in front, you can start asking the class variations of the key expressions. Who is taller? Is he the tallest? Get the class to help you line students up in order from tallest to shortest. Once students are in the correct order, give them flashcards to hold: tall, taller, tallest, and short, shorter, shortest. Practice pronunciation by having students listen to and repeat each word three times. 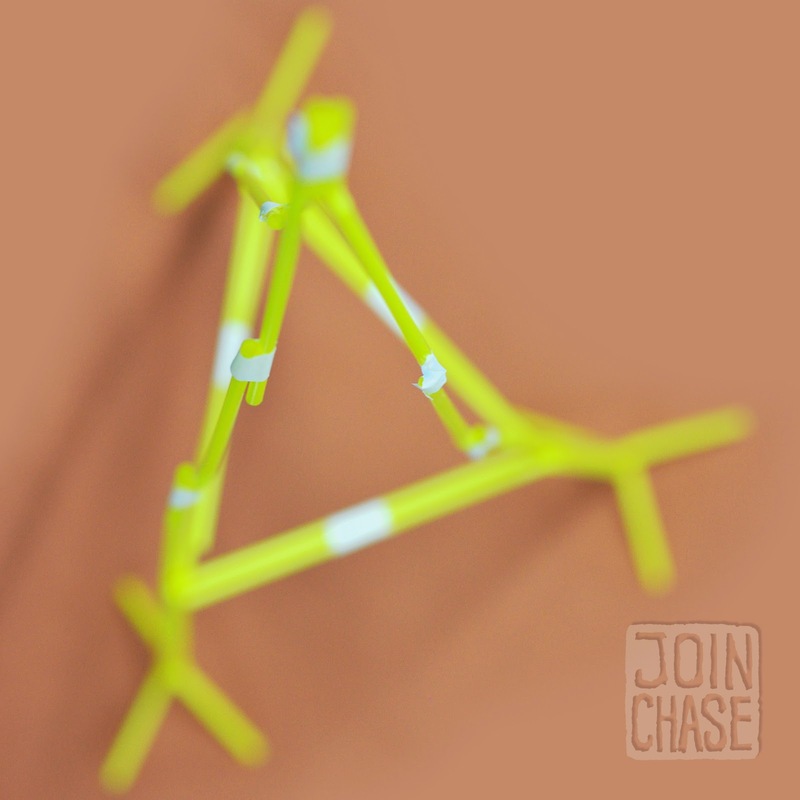 After volunteers have been seated, use lesson materials to give a visual example of other vocabulary words: long, longer, straw, build, and tower. Review colors and show some examples of long and longer with straws. Holding couplet visuals to use during the practice portion of a lesson. Pairing English expressions in question and answer form is something I learned to do through TESOL training with XploreAsia. It works really well with younger beginners. Create two visual aids out of materials you have available. I used straws, cardstock paper, tape, and a marker. Write ‘T’ for teacher on one, and ‘S’ for student on the other. You could also write ‘Q’ for question and ‘A’ for answer. Or, get creative by drawing faces or images, as long as they’re clearly different. These are used in the practice portion of a speaking lesson. It works well to have three pairs of sentences for students to focus on per lesson, and phrases should be loaded with the target vocabulary as well. Q1: Who is taller? / Who is shorter? A1: She is taller. / He is shorter. Q2: Is the green straw longer than the blue straw? A2: No, the green straw is shorter. Q3: Which is the tallest tower? A3: The red tower is the tallest. 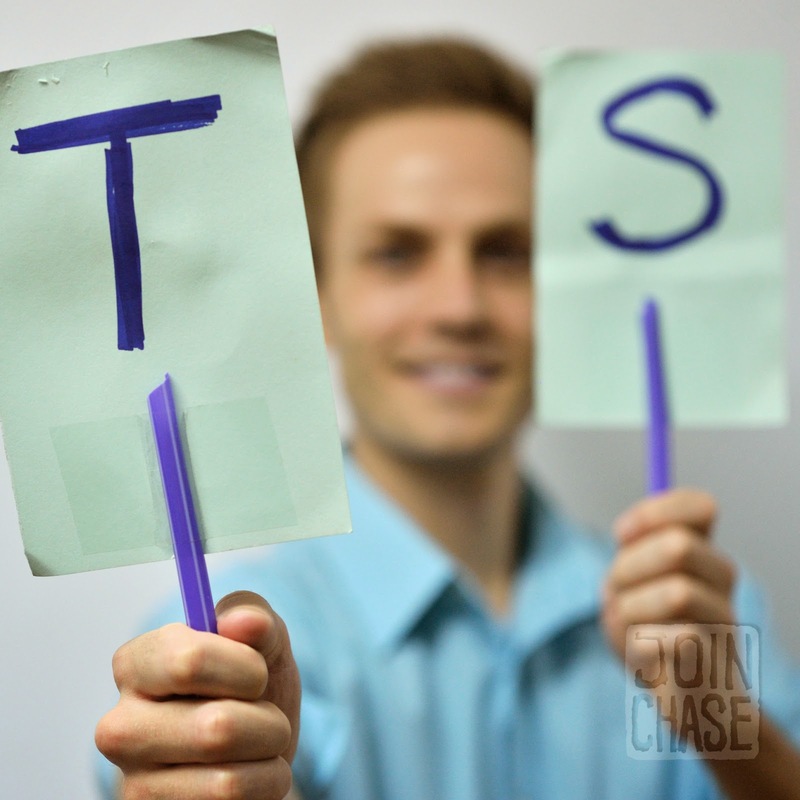 Each question and answer should be practiced in this order: TT, TS, ST, and SS. TT: Students listen to the teacher ask and answer the question. TS: Teacher asks the question, and different groups of students answer. ST: Various groups of students ask the question, and the teacher answers. SS: Groups of students take turns asking and answering the question. Each pair of expressions should be done three times. Use your couplet visuals to give an example of how to properly structure sentences, and also as a clear way to show who is asking and/or answering. Lastly, make sure there’s equal participation in the classroom. Place weaker students in small groups, and vary who speaks each time. Practicing couplets can be done individually, in pairs, in small groups, or even as an entire class. A student in Myanmar playing Stack 'Em during an English lesson. 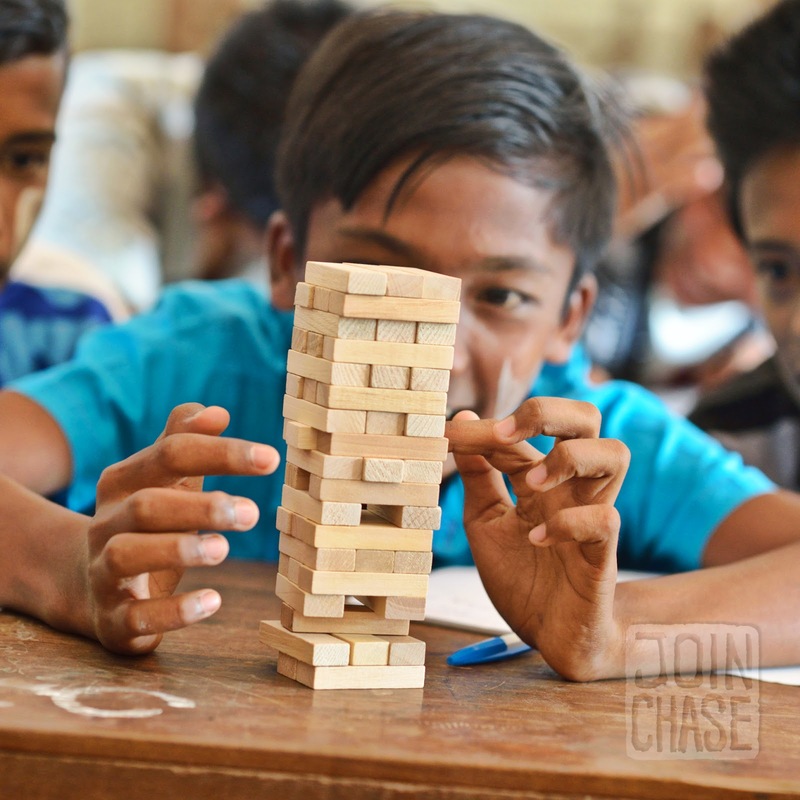 Using Stack ‘Em or Jenga is great for getting students to practice asking and answering questions naturally. It can also be done in pairs, small groups, or as a whole class. I use mini towers for group work, and a full-size tower (or two) when doing activities as a class. One way to play this game is to have students take turns asking and answering expressions. When one student takes a block and stacks it on top of the tower, the last student who played must ask him or her a question. This repeats for a certain amount of time, or until the first tower falls. I usually give students about 10 to 15 minutes to play, and measure which tower is the tallest at the end. TIP: If towers fall during the given time period, have groups quickly restack them and start over. This eliminates the potential for teams to purposefully knock over a tower so they don’t have to practice speaking English as much. A tower made out of straws for an English lesson on superlatives. Split the class into equal teams of no more than five students. You should have 33 straws (30 long, three short) per group. Make sure straws are separated by color. Give each team a long piece of tape as well. Show photos, or an actual example of a tower to provide ideas. I give classes three rules for this activity. Teams should work well together. Students must only speak English or gesture. Towers have to be freestanding (meaning they can’t be held, taped down, or braced against something). Really encourage students to speak English as they work together to build the tallest, most creative tower in a short amount of time. This is the most difficult part of the lesson. It’s often very quiet. I tend to punish older, more advanced learners for speaking anything other than English by taking away straws. Since teams only get a limited amount of materials, this method works well to keep them focused. I kindly remind younger students to think of English words they can use to share ideas. At the end of the activity, place towers together for judging. Allow students to ask and answer questions about their towers using the comparatives/superlatives they’ve practiced. Measure for the tallest tower, and have the class vote on the most creative. Award prizes to winning teams. Students playing English Pong during an English lesson in South Korea. English Pong is one of my favorite activities to use in an English lesson, and it’s a perfect way to end class on a good note. Divide students into two teams. You’ll need a Ping-Pong ball, six cups, and one small table or desk per team. Set up tables an equal distance apart, and place six cups on each. Cups should be in rows of one, two, and three. The objective of this initiative is for a team to throw the ball inside the cups of the other team. Students should wait in a single-file line, and take turns throwing the Ping-Pong ball. Players from each team must ask and/or answer a question before tossing the ball. 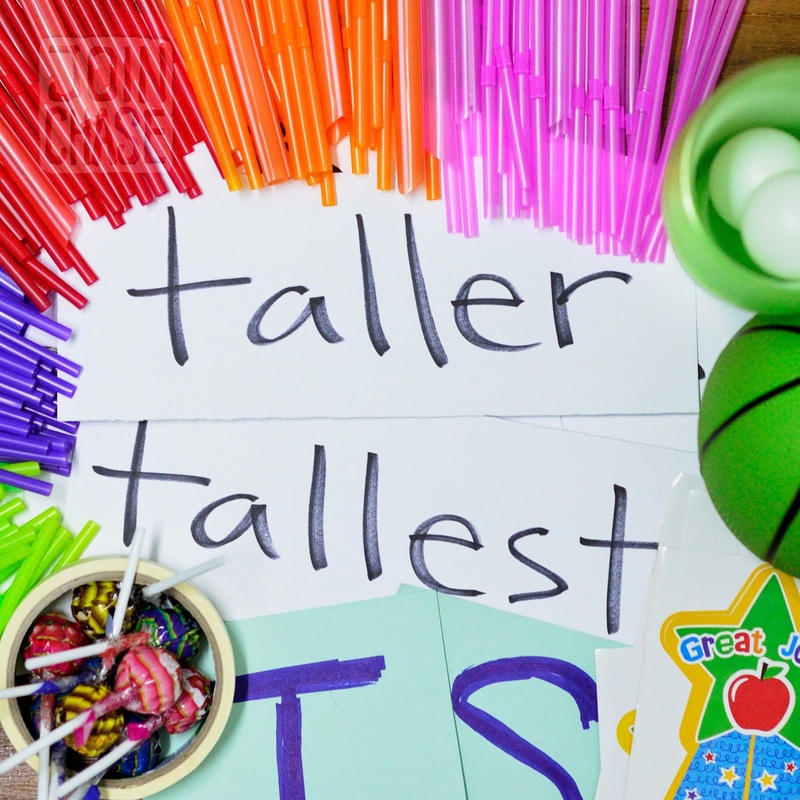 Review key expressions from the lesson by getting students to ask each other questions about different straws, the towers, and/or each other. Which straw is longer? Is the red tower taller or shorter than the blue tower? Who is the shortest? I usually let the student who answers a question throw the ball, and then the next student in line asks a question to the other team’s player (who would’ve just asked a question to the last player who threw the ball). When the ball lands in a cup, the cup is removed from the game. If the ball doesn’t land in a cup, nothing happens. After a student has asked, answered, and thrown the ball, they should go to the end of the line. The first team to remove all six cups from the other team wins, or whichever team removes the most cups within a limited amount of time. 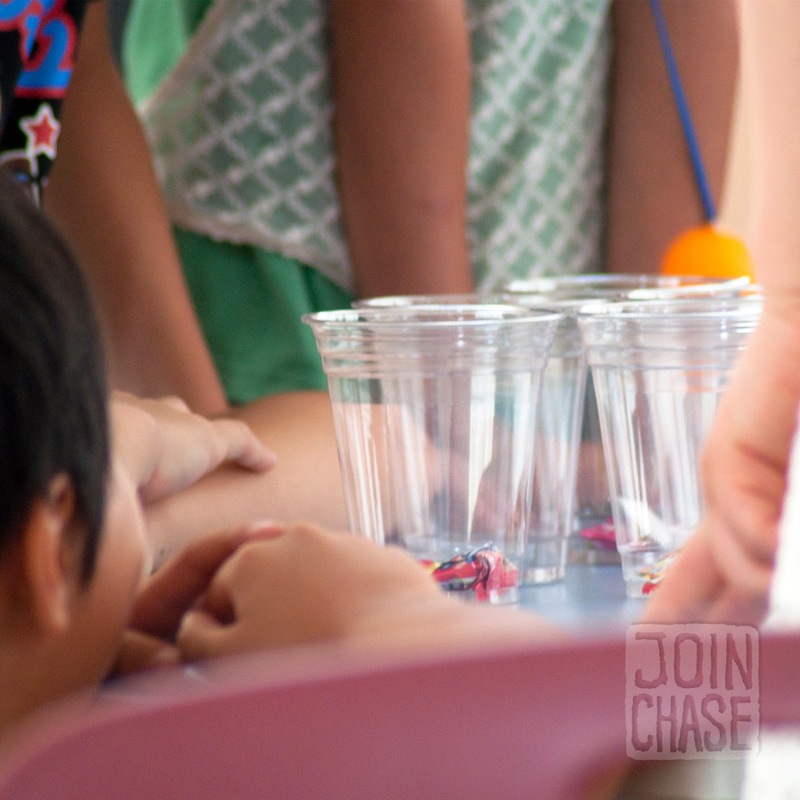 You could add a small prize inside each cup to make this activity even more fun.